My family loves fried chicken, so I usually indulge them. I on the other hand get so tired of it, I make something else for myself. I take the backs and wing tips, which no one really likes but me anyway, and I usually make either tinola or arroz caldo. I didn’t really have the usual vegetables for tinola, so I used cabbage and baby bok choy from our garden. It still came out pretty good. 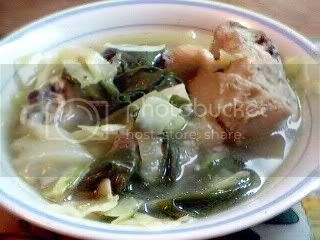 : Filipino style chicken ginger soup with vegetables. Heat the oil and sautee the garlic, ginger and onions until fragrant. Add the chicken pieces and fish sauce (start with about 2 tablespoons and add more later if needed). Sautee for a few minutes, and add the water. Let it simmer until the chicken is tender. When the chicken is done, check the broth for seasoning and adjust. Add the vegetables, and cook just until they are wilted or changes color. If you like your vegetables more done, you can cook it longer. We like ours to still have a little bite to them. UPDATED PHOTO (12/06/2010): I recently cooked this pepper leaves and green papayas, just the way it’s supposed to be. 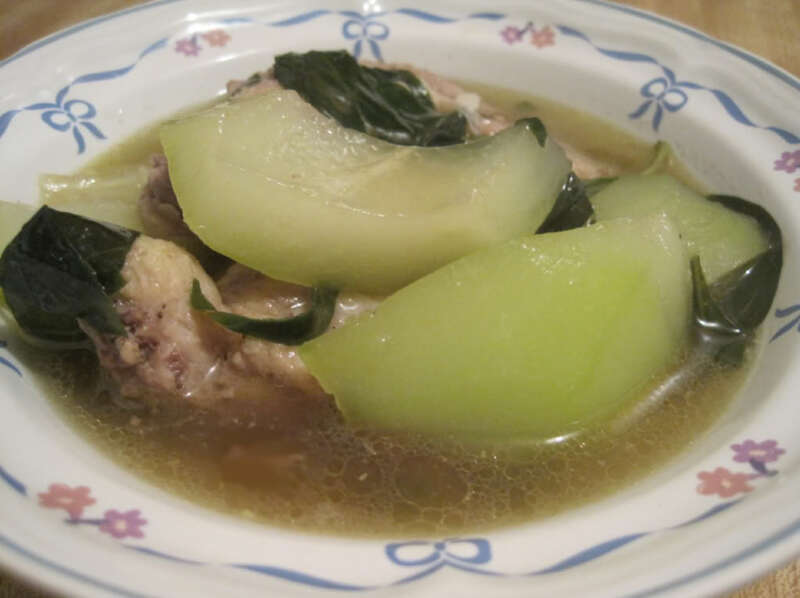 Click here for a new photo of chicken tinola. Interesting…i growing up in MN I only ever had cabbage in the tinola my lola made. She also added sutanhon (sp? )…celephane rice noodles. Ive always been interested how pinoy recipes have been somewhat altered to fit the local landscape. We never had problems finding patis though! Hi Erwin, I’ve heard malunggay used for tinola before, my lola did the same, but I have never heard for jackfruit before! I am assuming you’re talking about the green jackfruit instead of the ripe? Unfortunately, we don’t have 99 ranch here. I love 99 ranch! You must be in CA? I sometimes use jackfruit and malunggay as a vegetable substitute. It’s available in many frozen section of asian stores like 99 ranch or Lyons. Hi Bec, thanks for visiting. I too have had a hard time looking for the traditional tinola ingredients, like green papaya and sili leaves, so I improvise. Chayote which is now pretty common in grocery stores is a pretty good substitute for green papaya. Thanks for posting this recipe! I was out surfing for recipes and found yours. My Lola’s recipe doesn’t have papaya in it, though. She also skipped the patis since high blood pressure ran in our family and the fish sauce tended to aggrevate it.